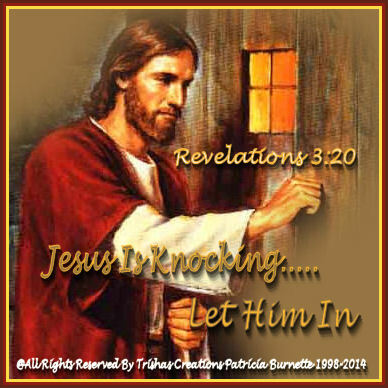 Welcome to "Jesus Is Knocking..... "
Let Him In Revelations 3:20, teaches us, Jesus knocks at the door of many hearts, and still to this very day, but we all need to remember that the doorknob, is also on our side. Jesus is a fine gentleman, and He will not come in unless you "Welcome Him In" . If, you keep feeling a tug in your heart and you are feeling like some is earning at you to do something else, Jesus is tugging, He's knocking, He's waiting for you to open that door, to let Him come in your heart and save you from sin! Jesus, will not come in, unless He's welcomed. Jesus will not violate you. Jesus brings hope, love, healing, peace into our lives, He loves us unconditionally. He is so anxious to visit you and come in and sit and dine with you! He will restore all you have lost! So let Him in before it's to late! Jesus is Coming Soon and we do not want you to Miss Jesus.... Let Him In Today You will be glad you did!!!!!!!! He will wait on the invitation, but don't wait to late, Ask Him into your Heart Today! Revelations 3:20 if you would like to read more! If, you do not know Jesus, you can go to this page and ask Him into your heart by saying the Sinners Prayer For You.